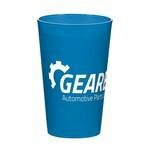 These branded plastic cups are great for branding at an event. 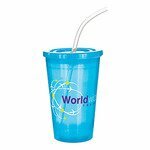 They are the perfect wwy to show off your logo in a drinkware item that people will use on the day or keep for use afterwards. 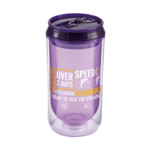 There are a few of the plastic cups we can supply branded with our logo shown below. Please take a look and if you cannot find the one you are looking for let us know and we can send your further examples or samples or arrange for a virtual visual showing how your logo would look on one of the products. Can you supply solid and translucent coloured bodies? 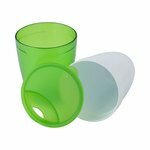 Each plastic cup is available in a range of colours and some of the products are available with sold, frosted and translucent colours. Please check out the colours for each product and let us know if you need a different colour as this may be available from our supply chain. 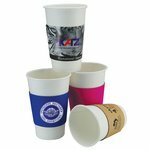 How do you brand a plastic cup or beaker? The most common print method is to use a screen print. This allows for a combination of screen colours from one to four passes with one or two being the most common. 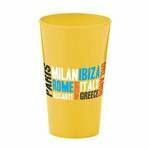 The final screen print is hard wearing and will last provided the cups are washed correctly and not damaged. 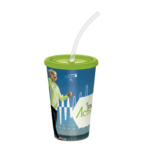 Why are cups also known as beakers? The term ‘beaker’ comes form the old Norse word ‘Bikarr’ and Dutch term ‘beker’ which were used in the mid 14th century in a similar way to the term ‘goblet’. 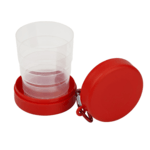 The term describes an open necked drinking vessel.